This post has given me quite a bit of trouble. I cooked this meal several weeks ago, diligently created the blog post the next day and attempted to publish it. However, thanks to stupid internet problems, I ended up losing everything I had created. After that, I got insanely busy and never felt like going back and re-writing everything. At this point, I’ve forgotten what I wrote in the first place and it’s like I’m writing a new blog post – but I apologize for the blogging hiatus. The truth is, I’ve been cooking a good amount lately thanks to the glorious return of football season. First, I reprised the cheese biscuits with bacon honey butter that I made at the beginning of the season last year. That was a hit at the office. Then, I made pigs in a blanket for Georgia Tech – Wofford, a game which was a little too close for comfort. Pigs in a blanket are still something I need to perfect. Then, I made wings for a buddy’s Labor Day barbecue and proceeded to eat more than half of them myself. All that is to say, even if you are cooking for the weekends, you still have to eat on weeknights. So, it’s summer, everybody is busy and you need something quick for dinner. This meal is a great, super-fast, cheap option. Plus, to make chicken paillards, you get to beat the crap out of some chicken breasts, which is a lot of fun and happens to be very cathartic. I needed some catharsis after my first failed attempt at posting this. Place one chicken tenderloin between two sheets of plastic wrap. Using a mallet, meat tenderizer or rolling pin, pound the tenderloin to about 1/4 inch uniform thickness. Remember that the meat will contract over heat, so err on the side of too thin. Repeat the process with the other tenderloin. Heat a large, heavy skillet over medium-high heat. Season chicken with salt and pepper to taste. Add a tablespoon or so of neutral oil, like canola or vegetable, to the pan once it is hot. Put one piece of chicken in the pan, cooking 4-6 minutes total and flipping the chicken about halfway through. Place cooked chicken on a plate. 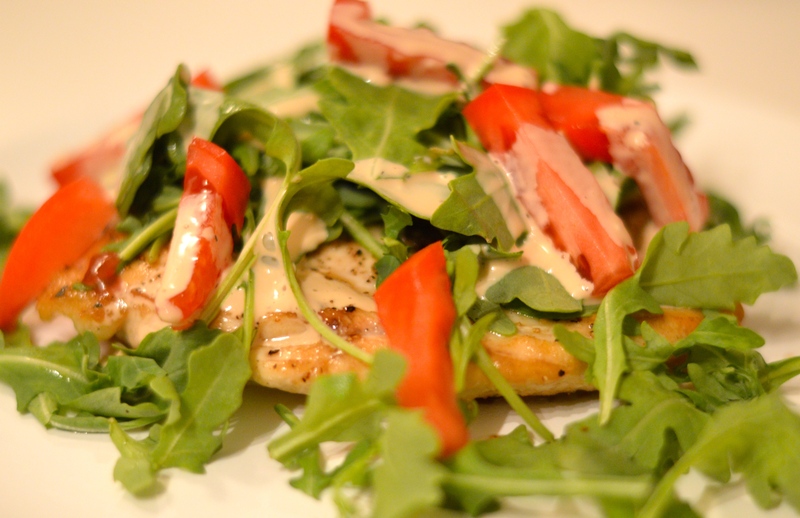 Mound half of the arugula over each piece of chicken, then add tomatoes and any other salad toppings. Whisk together the dressing, adding water if it seems to thick, and drizzle over the whole plate.